After a long dance on the silvery waters of Lake Koman, the sun sinks to the west, behind a rosary of dark peaks. The late autumn sky becomes ethereal, almost like glass – it is in this moment, suspended between night and day, that you really feel all the distance between Mërtur and the rest of the world. On the woods of the massif facing south, beyond the bed dug by a restless stream, a spiral of smoke rises slowly. A lamp lights up far away, together with the first stars, to signal the presence, otherwise impalpable, of other human beings. Then it goes out, and everything around goes back to dark and silence. Until the beginning of the 1990s, over a hundred families lived in the squared, white stone houses of Mërtur, where, as an ancient folk song goes, "the flower grows on the stone". Today in the village, located at the far north of the municipality of Puka, in northern Albania, there are only four families left, plus some elderly people who come back during the summer months. "I don't think people really understood what democracy means, they just thought they could run away to the city". With a heavy, gnarled perch, Lukë Hasani stirs the must, bubbling in a large, dark plastic tub. Lukë, an arm disabled by an old fishing accident, is the head of one of the families that have decided to stay – at least for now. "When the Communist regime collapsed, everyone fled to Tirana, Shkodër, Lezha, or Durrës. Many then regretted it, especially the elderly: living in the city is not for everyone. Once you have left, however, returning to the village is almost impossible". While Lukë stirs patiently, his wife Bardhe takes care of the hive, after distributing the forage to the cows and calves that ruminate quietly in the stable. Their eldest Pashk and his younger brother Ndue take care of the goats, which they have just brought back from the pasture – from the sheepfold, with the irregular fence mirroring the steep profile of the mountain, comes the feeble bleating of the kids, monotonous and insistent. Eternally busy, Malbora – Pashk's wife – goes in and out, intent on preparing lunch – the housework, the heavier chores, all fall on her small figure, silent and full of energy. The fate of Mërtur, though extreme, is not unique: the entire district of Puka, formed by two municipalities – Puka itself and Fushë Arrëz, further east – has suffered devastating depopulation in recent decades, going from about 59,000 inhabitants registered in 1990 to the current 33,000. The ruinous collapse of the Albanian communist dictatorship – the most paranoid and hermetic in Eastern Europe – has dragged along its top-down economic system, based in this region on mining and forest management. Today, Puka is one of the poorest areas in Albania: almost half of the families receive some kind of social assistance and two-thirds of the population live below the poverty line. Unemployment – estimated at above 20% – shows particularly high rates for young people and women. "With only one arm, finding work in the city was not granted. And then there is the love for Mërtur, for our roots: our ancestors are said to be arrived here over 300 years ago, from a village near Kruja, to escape the advance of the Turkish conquerors". Lunch is served: Lukë is at the head of the table, around sit the rest of the family and the guests from far away. The hospitality of the Hasani family is straightforward and essential: the main dish is the "ferlik" (kid roasted on the spit for at least a couple of hours), along with fries, fresh goat cheese, liver, and "turshi" – vegetables in brine appreciated from the Balkans to the Middle East. All this, of course, accompanied by "raki", a crystalline, surprisingly delicate pome fruit brandy. "I still believe that the future is better here than in the city", muses Pashk who, after graduating in Tirana, now works as a veterinarian for the municipality of Fushë Arrëz. "But staying is a difficult choice. Here we are removed from everything, we must be self-sufficient in all things, and the many promises made in recent years by politicians and administrators have remained empty words". The dirt road that leads from Iballë, at the bottom of the valley, to Mërtur – the umbilical cord between the village and the rest of the world – is an endless procession of hairpin bends, sometimes suspended over a menacing cliff. "Every winter, when it snows, we remain isolated, even for months: the only connection with the rest of the world is then the ferry that crosses Lake Koman. We must take care of the road ourselves: we have never received any help from the municipality or the government. In all these years, they have not even been able to build a fountain", bitterly adds Pashk. The room where we sit reflects the sobriety of the two-storey house: the floor and ceiling, painted blue and red, are made of heavy oak planks, burnished by smoke and time. Contemporary civilisation peeps out only from the opaque screen of an old cathode ray tube TV, placed in a corner, broadcasting nonstop video clips of Albanian hip-hop, full of sunglasses, tight clothing and sports cars, creating a weird sensory short circuit with the almost monastic simplicity of the dining room. "Life here is simple, if all goes well, you earn enough to live", Lukë continues, "but maybe money is not even the biggest problem. If you need a doctor, you need to go down to Iballë. The school is still open, but for how much longer? There are three children and two teachers, who come every day on foot or by motorbike from the village of Berisha. And to think that, until the 1990s, there were over 170 children!". Agriculture and farming play a fundamental role in the economy of the Puka region. According to the scarce data available, 70% of families in rural areas live only on agriculture and livestock. Alternative opportunities are scarce in villages, even for those with degrees. Malbora, for example, has a degree in education, but working as a teacher, given the lack of children, is impossible. "Of course, I would like to teach, I would like it above all else. But to be a teacher you should go to the city", she confides in a dreamy voice. Her gaze lights up, then lowers, and seems to get lost far away. Around here, almost everyone has some cattle, but especially small ruminants, sheep, and goats. In the district, the sector employs around 1,500 people – this is, however, pure subsistence farming, with just 200 farmers with at least 50 sheep and/or goats. In the sheepfold of the Hasani family, there are 130 goats and 50 sheep; in the stable, six cows and five calves. Unlike with most local producers, not all milk production is used for self-consumption. "Goat cheese (djath dhije) and kids are the most important items in the family economy. This year we have managed to sell about 800 kilos, along with a hundred kids", says Pashk. "For the most part, our cheese is sold by word of mouth to relatives, friends, and acquaintances down in Iballë or Fushë Arrëz, people who know well the quality of our pastures and our products", adds Bardhe. "Fortunately, then, we have a relative in Tirana who put up a convenience store. There the cheese is sold at a better price". Although they are perhaps better off than many others, the Hasanis suffer the difficulties and obstacles shared by farmers and livestock farmers in the area of Puka: isolation, limited number of animals, little cultivable land, lack of infrastructure for processing dairy products, access to the informal market at the limits of legality, lack of a registered designation of origin for regional products. "To build a future here, the idea – indeed, the need – is to build a new stable, get to 200 goats, and create the conditions to offer a better product", says Pashk. "More quantity and more quality, otherwise we will be forced to give up, like so many before us". Despite the low gears, the SUV trudges, slides several times, and starts again with difficulty on the dark tongue that cuts a primordial landscape, almost Martian, marked by rocks with metallic, oxidised reflections. The road leading to Blinisht is perhaps in even worse conditions than that climbing up to Mërtur. Geographically, Blinisht is closer to Fushë Arrëz, but here physical distances are relative, what matters is the (poor) quality of infrastructure. Blinisht is also on the verge of disappearance, with about a dozen families left of the over seventy who inhabited the village before 1990. Among those who stayed is Gjergi Prendi. Today, at his table, there is a group of friends and villagers: Edmond, Petrit, Arsen. Simple and tasty dishes, grapes, potatoes, cheese, accompanied by the inevitable raki, which warms up the heart and loosens the tongue. On two of the dark walls hang religious paintings, covered with multicoloured garlands and some withered flowers: on one side, a Jesus Christ in a long, white and blue tunic; on the other, a Madonna dressed in bright purple. 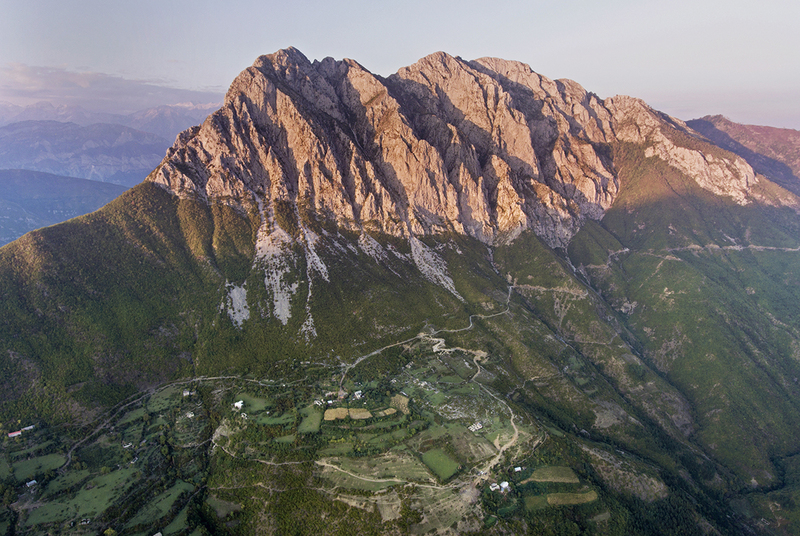 The Catholic religion is dominant in the region of Puka as a central part of the historical and collective identity of the mountains of northern Albania. About 80% of the population belongs to Roman Catholicism, while the remaining 20% are Muslims, in an area of traditional inter-religious tolerance. "We all emigrated from Blinisth and eventually some of us came back, out of necessity or melancholy. I am not at all sure, however, that we will be able to stay", confides Gjergi at the end of the meal, his eyes shining with a deep, lively blue. Behind the door, in a dead corner, stands a small pyramid of empty suitcases of different sizes and colours. "Every time I went to Greece to work, I brought one back, full of what I could buy. Every trip, a suitcase", he smiles. All have stories of emigration and hard work to tell, especially in Italy and Greece. "The first few years we entered Greece illegally, crossing the border on foot, with the fear of being caught and sent back", recalls Petrit, whose children walk every day for over two hours to go to school in Fushë Arrëz. Edmond tried military service, including a mission to Mosul, northern Iraq, where the Albanian army operated in support of American troops. "In the end, however, even there to be admitted to new missions you had to pay bribes to senior officers, otherwise you stayed home". Later, he says, he worked extensively as an agricultural labourer, first in France and then around Piacenza, but in the end, he returned to Blinisht too. "We all have around 50-60 animals, especially goats, plus a few cows: hard to go beyond survival. Now we plan to try to collaborate more, building a collective baxho [small, artisan-sized cheese factory] to improve the quality of the cheese. I think it's a good chance, not to be missed". "The question, however, is another", Edmond echoes, suddenly lowering his voice and his glass. "How do we find a wife? How do we convince a woman to follow us here, in the middle of nowhere? To get to my house there is not even a road, we get there only by a mule track, on horseback". The looks of the group remain suspended along the silent walls: even the raki, crystalline and full of heat, seems to fade suddenly, take on the cobalt nuances of melancholy. In Mërtur, just before a new sunset, the dense scent of thyme fills the air, almost intoxicating. At the top, the stony heart of the mountain seems to catch fire and the gaze is lost on the lines of the slope, which turn emerald green here and there. Under a gash of sky to the southwest, the sinuous fjord of Koman's artificial lake shines again. Many people hope that this strip of Albania, this proud and often bitter land, can be saved by what today condemns it: its marginality and isolation, which make it – at least potentially – one of the last "virgin" destinations in Europe for quality tourism, alternative to the routes of mass tourism. At the moment, this seems more like an indefinite hope than a real possibility to restore life to a bleeding region. Precise figures and statistics do not exist: according to the data collected by the Agropuka association, about 6,000 tourists visited the area in 2015. These are mainly people who come to visit friends and relatives, but also some actual tourists, looking for relaxation or adventure in the mountains of the region. There is no lack of issues: few hotels, few agro-tourism facilities. Even from an environmental point of view, isolation has not always meant preservation of natural habitats. The first, chaotic years of transition were marked by massive, indiscriminate deforestation, which has left deep scars on the landscape and created the conditions for a strong erosion of the slopes. The beauty of the landscapes of this unique land, however, is unquestionable, like the secular tenacity of those who were born and live in these mountains, and are perhaps condemned to love them in spite of themselves. The odds today are all against, or almost so: it is difficult for tourism to become an important resource without an overall strategy, made of initiatives from below, but also of promotion, marketing, synergies with other regions of Albania and, why not, the Balkans – all things that cannot happen without the intervention and guidance of the national institutions. Meanwhile, Mërtur, Blinisht, and the mountain villages await, survive, fight, do not give up. They hope not to wither, to regain lymph and vitality, and to come out again after the winter, tender and stubborn, like the "flower that grows on the stone".